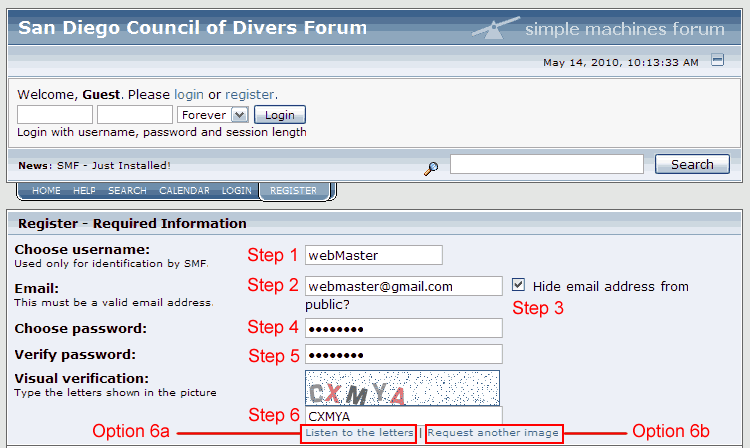 This page will show you how to register as a forum user on the San Diego Council of Divers Forum. Select this link for an MS Word file. Select this link for a PDF file. When you come to the forum for the first time, the top left corner will look like this. Notice that it reads, “Welcome, Guest.” As a guest, you can’t do much in a forum so you need to register and create your own profile. You can begin the registration process by selecting one of the two registration links as shown above. Both links take you to the same page. Your next step is to create your profile and become a registered user. Create a name you would like to use in the forum. I chose “webMaster.” You don’t have to capitalize any letters in your name. I did just because I think it looks cool. Select if you would like to hide your email address on your profile. The reason I have selected the box is because I don’t want other members of the forum to be able to contact me directly through email. If I wanted other members to be able to contact me through my email address, I would not have selected the box and there would not be a check in the box. Retype the same password again so the computer system can make sure you didn’t make a mistake when typing your password the first time. Type the letters as shown in the box. This mechanism helps to reduce spam. If you cannot see the letters clearly, select the links which reads, “Request another image” and a new set of letters will appear. If you still cannot see the letters clearly, select the link which reads, “Listen to the letters” and the computer will read the letters aloud. Make sure your volume is turned on and you can hear sounds from your computer. Next, select the “I Agree” box which signifies that you have read and agree to the forum’s conditions of use. You will be taken to a screen which notifies you that you must check your email for a message from the forum. There will be a link in the message. You must select that link to become a member. This helps to prevent spam. Your email message will look similar to the one above. The black boxes will not be in your message. I put them in this one to protect my account. Select the link provided. You will be taken back to the forum. Simply enter your password and you will be ready to begin interacting with the forum.